You could grate the vegetables for a faster salad but it’s really worth taking the time to julienne everything in matchstick size pieces. This helps to retain a nice crunch in the veg and also looks great. A mandolin is very helpful here but if you don’t have one, a knife will be just as good. Cut the carrots, cabbage and cucumber into matchstick pieces. Try not to use the seeds of the cucumber, they will add too much bitterness and liquid in the end. Cut the mango into similar size pices and add 1/3 to the other veg. Reserve the rest for on top of the finished salad. Mix all the veg in a bowl.Add the zest and juice of the lime, the drizzle of honey, a good drizzle of sesame oil and some of the seeds, half of the peanuts and some torn coriander leaves.. Season with salt and pepper and mix. Taste to ensure seasoning is correct. 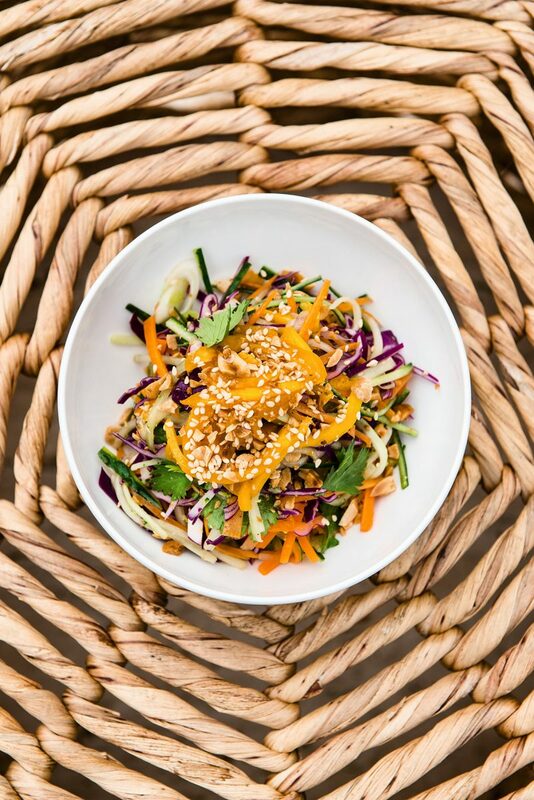 Place in serving bowl and top with the rest of the mango, peanuts, sesame seeds, coriander and another drizzle of sesame oil.